In May, in London, England, Andrew Mackenzie Hull died in a bike accident. In November, he came back to Toronto. 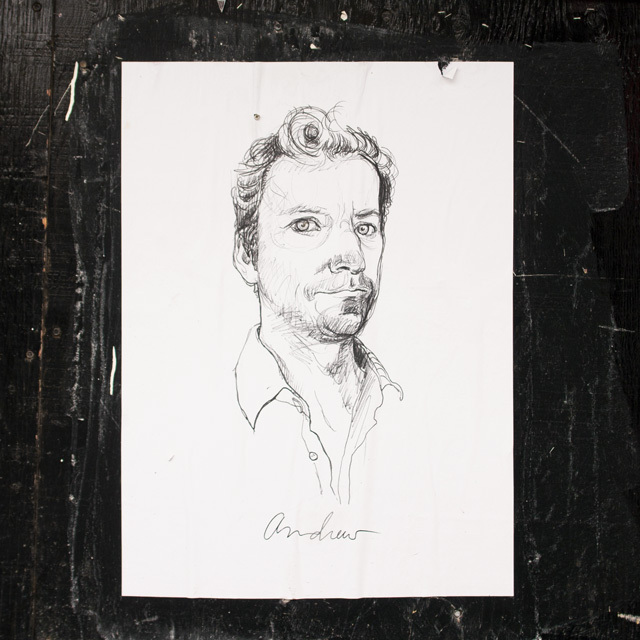 Stretching across the city, from Queen and Beaconsfield to Spadina and Bloor to the Leslie Street Spit, are one thousand identical posters of Hull—black ink on white paper, a life-sized portrait drawn and shaded by a ballpoint pen. From construction hoarding plywood and long-abandoned windows, he stares straight out, and if you hold his gaze, it starts to look as though he might be about to smile, though it’s hard to tell for sure. Below where the drawing ends, just before his open collar would have closed, is the word “Andrew,” handwritten with that same ballpoint pen. That’s it: a face, and a name. Starting in November, Syed spent nearly every night, sunset to sunrise, putting the posters of Andrew’s face up, sometimes with friends and sometimes with the help of a pick-up truck, but usually by himself, by foot. By the time he stopped, it was three weeks later, and December. But, he added, Andrew may well have liked the posters just the same. 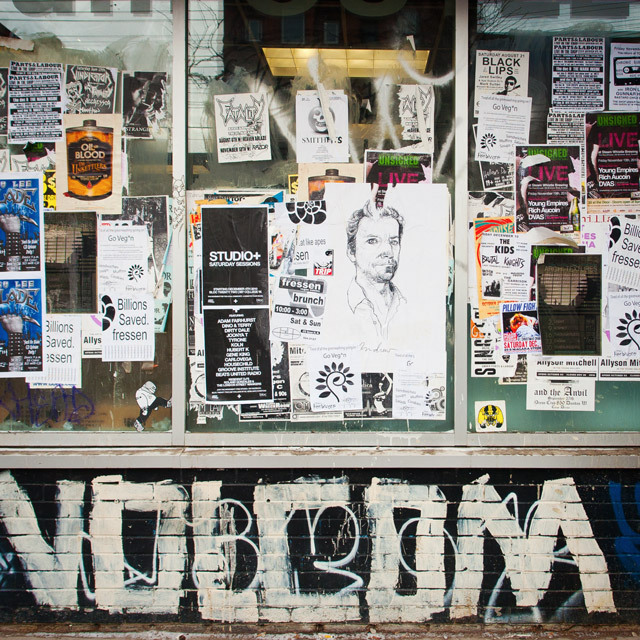 Syed, now back in London, collected photos of the posters during the daytime after he put them up, “as they aged—either they were ripped down, graffitied, or postered over.” He’s making a book documenting them; he did something similar for another friend, Jane, in 2001. “The Andrew Project,” Syed says, “only ends when people forget about the image.” It’s hard, now, to imagine that they could. Photos by Michael Chrisman/Torontoist. BlogTO and Metro Morning have both also reported on the posters recently. 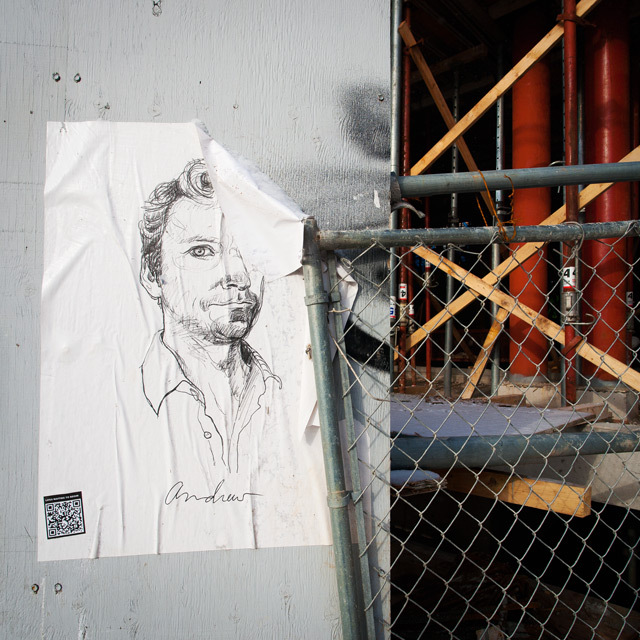 Filed under andrew mackenzie hull, shaan syed, art, discovery, Mystery, Street Art, Vandals!